[Blind Gossip] This United States Governor has kept a big secret for a long time. [One of the men from his past] is thinking of doing a tell all book. In it, he would detail how the Governor was his lover for many years and the hypocrisy of the Governor’s support of “repressed” groups of people while being very repressed himself. By the way, yes, his wife knows he’s gay. It’s supposedly a marriage of convenience. [Optional] Did you suspect he was gay? Florida governor-forget his name. Totally thought he was gay and marriage for cover-up. I don’t know who it is, but I’m sure it’s a Republicans he’s more than likely vocal against gays. Happens ALL the time! Hypocrites!!! I think so, too. And, I saw a recent article where he was discussing the “repression” of the people of Cuba. Could this be John Hickenlooper of Colorado?!? 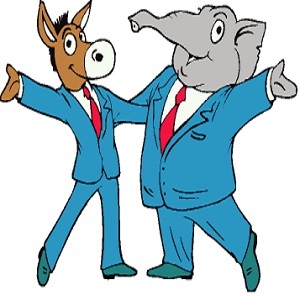 Clues: the donkey and elephant together – Hick (a Democrat) has gotten a lot of press lately for his collaboration with republican John Kasich. Marriage of convenience – he recently married a much younger woman and it seemed like an odd pairing. If it’s him – I did not suspect he was gay. He’s been married 2x and both women seem like intelligent, accomplished, low-key women… not at all like trophy wives or beards. Who knows. Deval is no longer Governor in Massachusetts. My money is on Brown in CA. Oh I hope it’s Jerry Brown. He’s ruining that state! He ruined it by balancing our budget and helping our economy surpass France to be the 5th largest in the world. Also you seem to think being gay would be a punishment for him for some reason? use. Yes, he has messed up California big time. Being a bad governor has zip to do with what you like in the bedroom. Agreed! Jerry Brown has ruined California. There are only 16 democratic governors. I think it’s Malloy/CT, he’s been vocal for “oppressed” people since Trump was elected. My first thought was former Texas governor Rick Perry. But the idea of him supporting repressed groups is out of character for him. My second thought was Jerry Brown of California. Just a thought. I’m guessing based upon states with “religious freedom” laws. If it said former governor I would have said it’s Mike Pence, but only considering current ones it’s most likely Phil Bryant of Mississippi. If it’s not Phil Bryant, then I’d guess Greg Abbott of Texas because “big” secret might be a clue for Texas. I think you nailed it with the religious freedom laws but why Phil Bryant? Scratch that, I just googled his picture. Yes, he’s totally gay. Scott Walker for the win. Easy. California governor Jerry Brown. Notice how the Democratic donkey is brown. I’ve lived in CA all of my life, and this has been a rumor since his first term in the 1970s. Whish he’d come out. Sad that he still can’t. OK, I’m abandoning my guess and going with yours. This makes more sense. Good observation on the brown donkey. Guess again. Brown has never been married. Married to Anne Gust since 2005 and she had a major influence on his political resurgence. They had been “dating” since 1990. Jerry Brown is absolutely married. Diane Feinstein officiated. MizGrandma, Brown’s been married since 2005. MizGrandma, Jerry Brown is married to Ann Gust. They’ve been married since 2005. No kids. Dear MizGrandma. I’m going with “sanctuary Jerry”, and yes – he is married to Anne Gust. I thought it was Cory Booker, until the ‘wife’ bit. Charlie Crist of Florida. Have been stories about him being in the closet forever. I’ll guess Kasich from Ohio. There was a rumor about him years ago. There might be two: Kasich and Jerry Brown. He’s divorced because of a kid with the maid and the article says this governor is currently married. If he were gay we would have known about it years ago. Scott Walker might be sexually repressed, but I highly doubt he’s gay. Gov. Rick Perry. Being in the closet is a longtime Texas tradition. rofl – spat my coffee. This would be epic. It’s pretty well known round these parts that Perry is on the DL. Idk how big of a secret it really is. ROFL!!! Wouldn’t that be special? Jerry Brown? The quotes around “repressed” are throwing me. Yep. We’ve known this since the 70’s. Also his “wife” was known as his lesbian friend. But Cory Booker isn’t a governor. Or married. Cory Booker is a senator. This is about a governor. Plus, he’s not married and this blind mentions that he is in a marriage of convenience. There is no way that this blind can be about Cory Booker. I’d go with Charlie Crist, the gov from Florida. Gov of FL is Rick Scott who to my knowledge there has never been any rumors or innuendoes about his sexuality or any type of harassment of women. This is a blue state. Jerry Brown. There were rumors about this the first time he served as CA gov. It’s Jerry Brown. He spent four years studying to become a priest in the 60’s. I presumed he learned alot there. During his first stint as governor in the 70’s, I was an intern at the state capital. GAY GAY GAY! That whole romance with Linda Ronsdtadt was a sham. This is Jerry Brown of California. He is currently sticking up for Dreamers and undocumented immigrants, and Trump is decrying him for allowing California to have sanctuary cities. There are loads of articles about it that came out today. He got married for the first time at the age of 68. His wife got married for the first time at 47. There have been rumors about him. Also his wife was a high-level business executive and is rumored to be a lesbian. Isn’t Jerry Brown almost 80? If this is him then there is absolutely no reason for him to hide his sexuality in 2018. In fact, it’s a slap in the fact to all gay people who have been out and open about it while he hid to advance his career. I would not put anything past him. He’s clearly a Sociopath anyway.